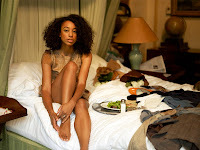 The much anticipated new record from Grammy winning songstress Corinne Bailey R ae was released today, January 26. The Sea, the follow-up to her 2006 self-titled debut, is an intense, emotion filled ride. This is the record you'll put on when you're "goin' through stuff" or "gettin' over stuff." 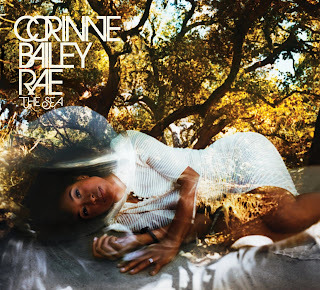 Bailey Rae's vocals are sweet and charming; they're beautiful and skirting the edge of darkness. They're fragile one moment and the next there's a show of inner strength. The highlight of the album for me is "The Blackest Lily." It has been announced that Bailey Rae will tour North America this Spring. And guess what New Yorkers?! Yep, she's going to pay us a visit. She'll be a Webster Hall on May 3. See below for a list of tour dates. To promote The Sea, Bailey Rae will be making a number of television appearances. She'll be on Tavis Smiley, January 27; Ellen, January 28 and The Late Late Show with Craig Ferguson on January 29. Also, prior to her just announced tour, she will appear on Late Show with David Letterman, March 1 and Jimmy Kimmel Live on March 8. Check your local listings for appropriate times in your area. Back in December, I went to see Bailey Rae at Hiro Ballroom. She was doing one of a handful of live previews of The Sea. That show was recorded for PBS' Live From The Artists Den which will air in the Spring. But, in celebration of the record release, four songs from the performance will be featured on the free online video service Hulu beginning today. Check it out below. If you haven't already bought The Sea, you can check out what you're missing. Both AOL and MSN are hosting listening parties.